The second half of the NFL season begins this week and, with it, the playoff watch begins. Several games are on the docket this weekend that could have playoff implications for the franchises involved. First, in Baltimore, the Ravens host their AFC North rivals, the Pittsburgh Steelers. The Ravens won the first matchup between the two teams this year, 26-14 back in Week 4. Since then, the teams have headed in opposite directions. The Steelers have won their three subsequent games while the Ravens have lost three of four. If Baltimore wins this weekend, they hold the tiebreaker over the Steelers should the teams end the division race in with identical records. 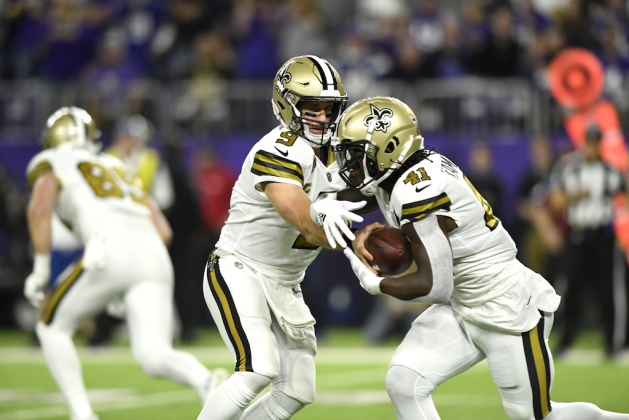 Meanwhile, in New Orleans, the Saints face the Los Angeles Rams, in a game that won’t have divisional implications, but could decide home-field advantage throughout the NFC playoffs. The Rams enter 8-0 while New Orleans is 6-1. A win for the Saints draws them closer in that home-field fight, while a Rams’ win could give them a dominant advantage over the conference. To get some insight into those games, along with several others on the schedule this weekend, we turned to CBS 4 Miami sports anchor Jim Berry. Jim weighed in with his thoughts on four matchups this weekend that catch our eye for various reasons. This is always a bruising football game, and this Sunday figures to be no different. The Steelers will be motivated because it was Baltimore that handed them a loss earlier this season. But that was when the Steelers were still trying to figure out life without Le’Veon Bell. They have figured it out now, winning three games in a row. Meanwhile, the Ravens have struggled; they have dropped two straight. Joe Flacco, their quarterback, says, ‘You know what, there’s no lying in the NFL, at 4-4, their record says that they’re average.’ They’ll be below average now, because I think the Steelers are going to beat them, with the final score being 27-13 Pittsburgh. I like the Dolphins in this one, even though their defense has been woeful lately. But, have you seen the Jets’ offense? It has been even more woeful. They really struggled in losing to Chicago last week, and I don’t see that improving too much this Sunday. The Dolphins win 24-13. The Rams, at 8-0, taking on the Saints, at 6-1… talk about a juicy matchup. The Rams were lucky to escape last week against the Green Bay Packers, winning 29-27, as their special teams unit made a big play to preserve that victory and denying Aaron Rodgers the chance to steal that win. But, there will be no denying Drew Brees this Sunday. He is completing 77 percent of his passes, which is remarkable, especially when you consider that the guy is 39 year old. I’m predicting that the Saints will knock off the unbeaten L.A. Rams and make them 8-1. I like New Orleans winning it 30-27. Speaking of the Packers, they’re going to be in New England taking on the Patriots in a juicy quarterback matchup. Two future Hall of Famers in this game, with Aaron Rodgers taking on Tom Brady and the Patriots. I’m looking for Aaron Rodgers and the Packers to pull off an upset, beating New England at Foxborough, where they don’t lose very often. I like the Packers 27-21.